Compare funeral directors in Springburn and read verified reviews on the UK’s online funeral resource. Use Funeral Zone Listings to find local funeral directors in Springburn that meet your specific needs. You can organise the search results by ‘best rated’, 'nearest' or ‘most reviewed’. There is also a handy Google Maps feature so you can see exactly where each funeral home is in relation to each other. Anderson McGuire’s provided an excellent service from that very first phone call, all through arrangements; even into after care. 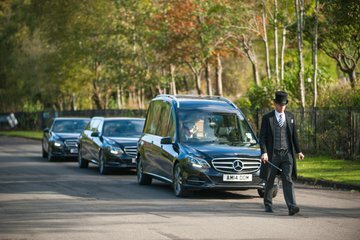 The undertakers showed great respect; treated our mum with care and respect - not just another job. Making us feel that she would be well looked after in their care. Gail our funeral director showed professionalism but with a great deal of compassion so at a very difficult time; she guided us through and nothing was too much to ask. She was there for us the whole way through. Also the drivers never rushed us. They spoke to us. Made us feel at ease. Thanks to all at Anderson McGuire. Maureen’s funeral went as perfectly as one could expect from a funeral. Anderson McGuire ‘s gave Maureen the send off she well deserved. Thank you to all the staff at Anderson MaGuire for all their help and support during the sad loss of our beautiful Maggie. A special thanks to Gail for Coordinating the Mass and the crematorium. I cannot recommend Anderson & Maguire highly enough from the first minute we contacted them for the funeral of our mother. Martha at the springburn branch was very helpful and with Christopher in charge of the funeral cortège we were in good hands. The professionalism shown and the courteousness of all the drivers was second to none. I would highly recommend Anderson & Maguire to anyone, as they would be in safe and caring hands at a sad time. Can't thank martha for all her help,she made it so easy to get through this hard time and Chris the funeral that took my dad to cremitirium was so respectful and nicest guy ever,can't thank you's enough.